Over the last 20 years, electrophysiology rigs have developed spontaneously around several platforms. In all, the central concept is that manipulators and the sample are fixed in one frame and the microscope is fixed in a second frame. These two separate frames of reference are then moved with respect to each other in order to locate cells. Sutter Instrument is now offering several systems or “Big Kits” that include dual manipulators and either manipulator stands and scope translator or large moving stage and a dual manipulator system as one big kit. By specifying and offering the Big Kit systems, Sutter is able to extend significant price savings over the same components purchased separately. The classic moving scope design with manual translator and three columns and two manipulators. Developed by labs at UCSF and later used throughout the Bay area, the U.S., and the world. The time-honored method allows for easy hand access to controls on the scope and manipulators for pipette exchange and other adjustments. Another classic design. Relies on a manual scope translator but uses a single large fixed plate stage rather than separate stands for manipulators. Many electrophysiologists want the ability to add additional manipulators or other devices to a single large platform. Both the San Francisco and the Alcatraz are available with a motorized (rather than manual) translator. Intended specifically for multi-pipette electrophysiology on two-photon microscopes. Designed in conjunction with Northwestern University and first used for the CSHL Imaging course. The large moving stage can easily hold an in-vivo or slice preparation and two or more manipulators. The scope is allowed to be fixed to the table top, which is required for scopes attached to two-photon sources. This same design is also good for systems where the scope has become too large to move easily, like spinning disc confocals and large camera systems. 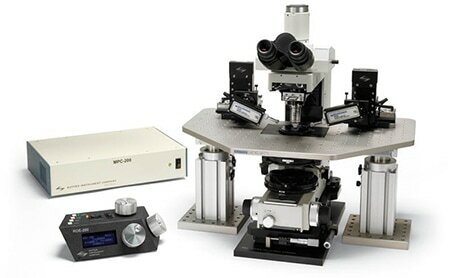 The stage and manipulator systems have been used on many two-photon and other scopes including those from Intelligent Imaging Innovations, Zeiss, Olympus and Leica. This configuration is also used by researchers in custom built two-photon microscopes. Motorized translation and motorized stage systems are compatible with a wide range of commercial and freeware imaging software platforms including Intelligent Imaging Innovations’ Slidebook, Scan Image, MicroManager and Sutter’s MCS – MOM Computer System. Please contact AutoMate Scientific for a current listing of software suites that are compatible with our products.